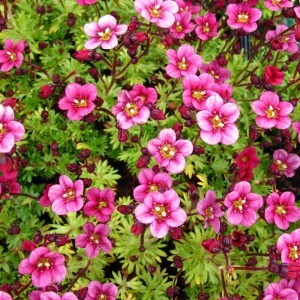 If a carpet of early pink color of what you are looking for give Touran™ Neon Rose Saxifraga a try. (Saxifraga) Touran™ Neon Rose Saxifraga has an excellent growth habit and grows very well in partially shaded rock gardens. Touran™ Neon Rose requires a cool moist location. It begins flowering in early spring and has a long bloom time. Saxifragas dislikes drought and hot humid environments. Don’t worry about those garden pests, this beauty is deer and rabbit resistant!